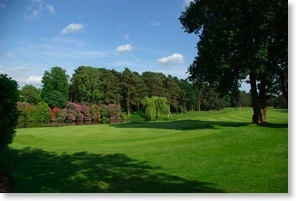 A link between Woking Golf Club and seniors’ golf was created in November 1958 when it was announced that there was to be a seniors’ Halford Hewitt for teams of public school senior golfers. Since Woking Golf Club had always been well represented in Halford Hewitt sides, it seemed fitting that Woking Golf Club should be the venue. The event was to be played in early July and was to be a foursomes match play competition off scratch. Each team was to be made up of 6 golfers, all more than 50 years old (now 55 years old). Participation was limited to the 15 schools which entered the Halford Hewitt in its first year at Deal in 1925, together with The Leys who competed when it was played at various courses around the Home Counties in 1924. Woking Golf Club demonstrated its enthusiasm for the new competition with an historic trophy and this silver claret jug which is normally kept in the Club’s trophy cabinet is an old golf trophy, the Gullane Prize of 1863. 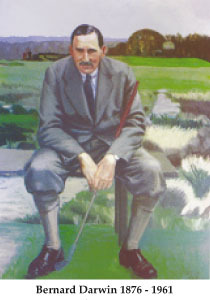 Bernard Darwin, a member of the Walker Cup team in 1922, an avid participant and later observer of the Halford Hewitt, was a strong supporter of the new tournament. He was President of Woking Golf Club at that time and was asked if he would allow his name to be linked with the new event. Thus we have the Bernard Darwin Trophy which celebrated its first 50 years in 2009, and two other competitions for more senior golfers from the same schools. The Senior Darwin Trophy was first played in 1987 (when interestingly only eleven of the sixteen schools chose to participate), this being open to players aged at least 65. In 1991 an additional competition for those aged at least 75 was started (The Veteran Darwin), this being a stableford over 18 holes with a maximum of three pairs per school. The format for the 2 day knockout competition is scratch foursomes matchplay. Those schools which are eliminated in the first round play a one round stableford competition in the afternoon for the Bernard Darwin Salver.